Monday’s Say Hey, Baseball includes David Ortiz’s push to 500 dingers, Jake Arrieta’s no-hitter, and the Little League World Series’ championship. Subscribe for your daily Say Hey! Listen, we know it’s tough to catch up on everything happening in the baseball world each morning. There are all kinds of stories, rumors, game coverage and Vines of dudes getting hit in the beans every day. Trying to find all of it while on your way to work or sitting at your desk just isn’t easy. It’s OK, though, we’re going to do the heavy lifting for you each morning, and find the things you need to see from within the SB Nation baseball network as well as from elsewhere. Please hold your applause until the end, or at least until after you subscribe to the newsletter. It was just a few months ago that it didn’t look like David Ortiz was going to get anywhere near 500 homers, that the end of his career as a dangerous bat had come to a screeching halt. He opened the season batting .219/.297/.372 with six homers in his first 52 games, a combination of recovery from 2014’s wrist injury and poor timing and decision-making at the plate the cause. Since then, though, Ortiz has hit .301/.396/.632 with 22 homers over his last 67 games, and Sunday’s blast against the Mets gave him 494 dingers for his career: that puts Big Papi ahead of Hall of Famer Lou Gehrig and Fred McGriff for sole possession of 27th all-time. 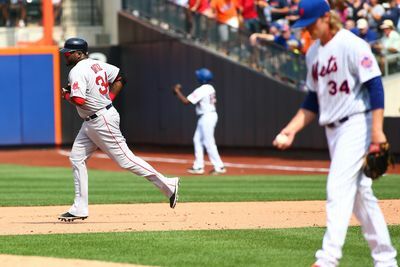 With 32 games left in the season, Ortiz should get to 500 homers in 2015. He would be the 27th player in history to accomplish the feat, and the first since Albert Pujols in April of 2014. He’ll also be the last one to get to that shiny round number for a while, as the next active player on the all-time list is Adrian Beltre at 408 — homers aren’t really Beltre’s thing anymore, and he’s 36 years old, so he might never get to 500. Miguel Cabrera is probably the next one to get to 500 homers, as he’s right behind Beltre with 407, is only 32 years old, and is arguably the greatest hitter in the league. So, appreciate Ortiz’s run towards 500 while you can, especially for its oddness. He was signed by Boston back in 2003, at age 27, and at that point only had 58 homers in his career. He’s cleared the wall 436 times with the Sox over 13 seasons since, and has at least one more left in him since his 2016 option has already become guaranteed. Will he make it to the top-25, the top-20, maybe even the top-15? Who knows, really, but at this point, no one should probably bet against him since he just keeps on mashing. Jake Arrieta threw a no-hitter against the Dodgers, giving Sunday Night Baseball fans a treat. He also had a bucket of ice water dumped on his head and showed up to his press conference wearing mustache pajamas, so it was an up and down evening for the righty. Apropos of nothing, the most recent Baltimore Orioles no-hitter came in 1969, which was roughly around the same time they last developed an impact pitcher who thrived in their uniform. Yeah, we could count 1991’s combined no-hitter and make the same joke, but clinging to a combined no-no would make you come off as pretty defensive, wouldn’t it? Get all kinds of MLB stories, rumors, game coverage, and Vines of dudes getting hit in the beans in your inbox every day. For the Dodgers, it was the second time they have been no-hit in the last nine days. Do no-hitters just follow around former Rays employees, or what? At least Joe Maddon’s team was the one throwing the no-no this time, instead of being the ones getting no-hit. Edwin Encarnacion crushed three homers, and his reward was a garbage bag full of hats. Japan won the Little League World Series, besting Pennsylvania in a game that would finish with an 18-11 score thanks to the dinger party. Starlin Castro has cleared waivers, so he could be traded to anyone in the league. If he is to be on someone’s playoff roster this year, that trade would have to happen today, but he can still be dealt through the end of the season. A controversial call caused the Royals to drop their series finale with the Rays, but given they have a 13-game lead in the AL Central and are six games up on the Blue Jays for home field advantage in the playoffs, it probably won’t come back to haunt them in the long run. Is #6org no more? That kind of depends on what the Mariners do next.